A means of building away from the KSC (Ground Construction/Extraplanetary Launchpads) is recommended but not strictly required. These parts are heavy, either UbioZur welding or careful assembly is recommended. Parts are designed to work with Umbra Space Industries, but will function as a simple cosmetic parts pack if installed without. 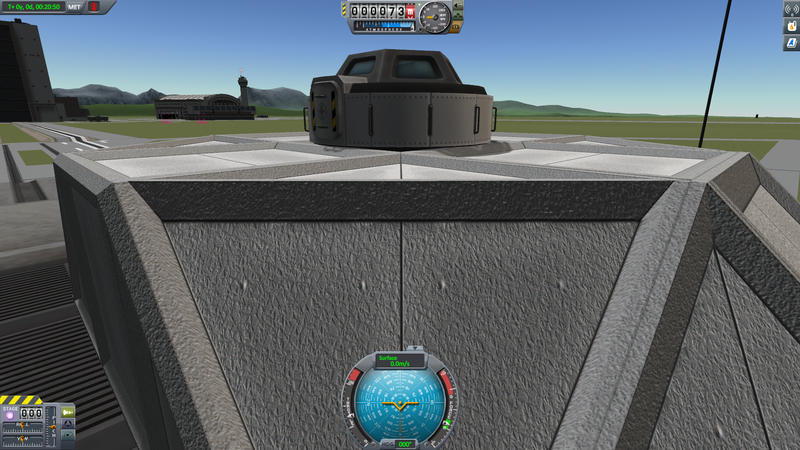 Functions with stock KSP install, contains configs for Connect Living Space, Umbra Space Industries, and Near Future Electrical compatibility. Hello chaps, not posted much at all so I hope this is not a breach of etiquette. 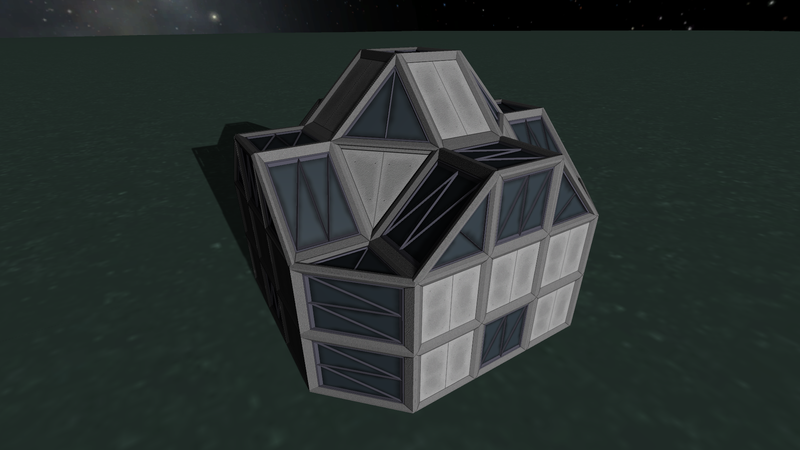 After a considerable break I came back to KSP some months ago to find that the base building aspect of modding has become very well developed. I started a new career mode and duly assembled first a rudimentary temporary shelter, then a network of inflatables that could feed themselves, then a fancy manufacturing base. Like any good materialist, however, I asked myself what would come next and considered that there may exist a niche for more permanent facilities in the style of science fiction imaginings from, for example, Kim Stanley Robinson's Red Mars. What I propose to pursue, then, is a project that incorporates a set of concrete (or equivalent material) parts designed to be manufactured on site using, for example, Allista's Ground Constuction, at greater economy than lighter, more mobile parts. I fear this is my first such project and have had to learn blender/unity/GIMP, thus the quality is most assuredly not the highest, still I present for you what I've put together so far with some stock parts for scale. Currently acutely lacking in detailed textures, but I feel they tesselate and snap together quite nicely to create a range of geometries. Yet to attempt windows, hatches, or bump mapping which I feel will probably be quite involved but add significantly. Have you considered part welding? Part welding does seem like it would complement nice to prevent droopiness. It is still a tree based structure I suspect that drooping might be a problem with more elaborate structures when I set the weight properly. I've been working on detailing the textures, as well as sorting out an inverted corner primitive. We've wear and bevel effects on the large panels, and filled in casting holes. 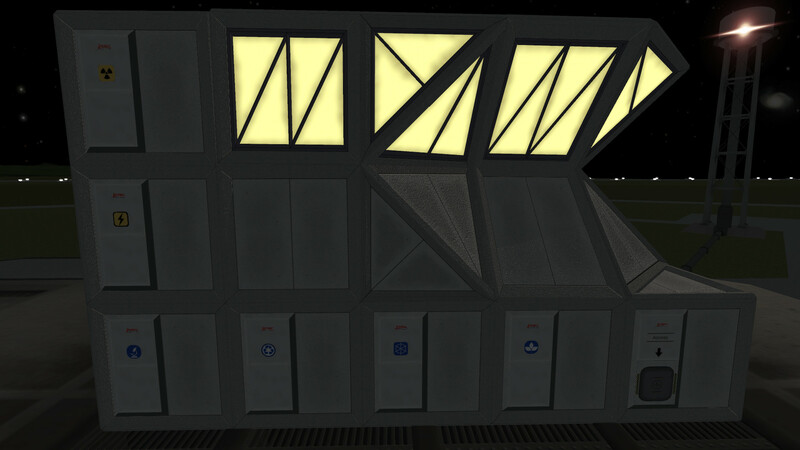 I'm quite happy with the effect and can't presently imagine anything else to add purely through textures, I'll probably not add dirt and grime, which seems to be a staple of concrete texturing, both for the shiny science fiction utopianess and variety of possibly environments. Masonry screws might add a nice metallic glint to the parts but I think they'd look silly without joining plates which probably warrant model detail. If anyone has feedback or suggestions I'd be pleased to hear them. Hmm, I've started making windowed parts and thought I could be slightly tricky by reusing textures with flipped UV maps (isomers, you know). But it seems this messes up the normal mapping. Am I correct in assuming then that to use normal maps and/or specularity maps all UV mappings need to have the same 'handedness'? Not a great tragedy if so, but would be a nice efficiency gain. Also, I'm getting some strange artifacts running along certain convex edges depending on where the sun is, not evident from pictures. It's present to a lesser extent on stock parts like the cupola that have convex edges and some reflectivity in their specular maps which suggests it might be unavoidable, looks like triangular shadows running endlessly along the edge. Anything I might be doing wrong to cause this? No emissives on the windows yet. Not sure how I want to distribute functions yet. 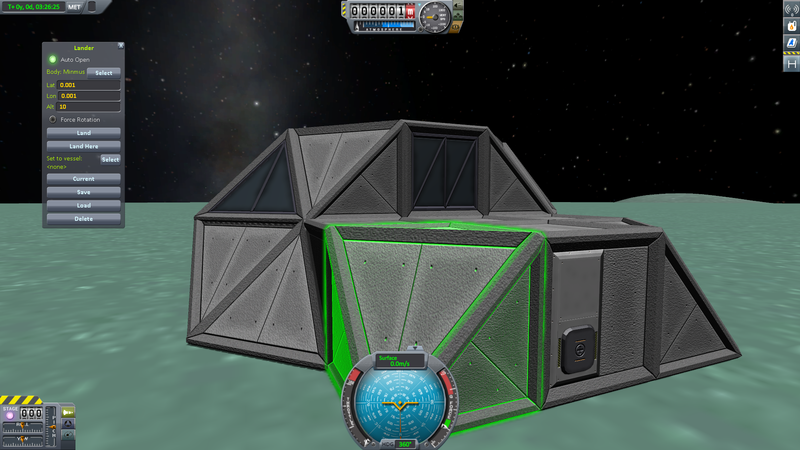 Probably USI LS hab multipliers/greenhouse on the windows, module swap on the plain parts for storage/hab time. Probably do parts with a single detailed face like the airlock for labs, battery blocks to feed all the USI modules, etc. I've put together a pre-release before putting it out into the addon releases section. I would appreciate it if any interested parties would give it a download and see if it conforms to expectations or if anything needs fixing. Github can be found through the download link for logging issues. Can't speak for the functioning parts. I play sandbox. Not sure how I'll use these yet, but I had fun for about an hour last night just snapping parts together. Works as advertised. Looks good up close. Nice Job. Real nice job on the textures, i'll download for a play when i can. What happened to this mod? Well, there were a few things. First of all, my working practices aren't terribly efficient and I was finding myself with less time. Secondly, having achieved a release I thought 'well, that's done, now I can proceed at a more leisurely pace'. Thirdly, I was trying to work on more detailed parts and while I thought what was coming together wasn't terrible it wasn't terribly good either. Lastly, I'd rather hoped for these parts to fill a role in career mode, but was having trouble finding a way to make that balanced, and by the time I'd have the infrastructure myself in place the scene would be too laggy regardless.